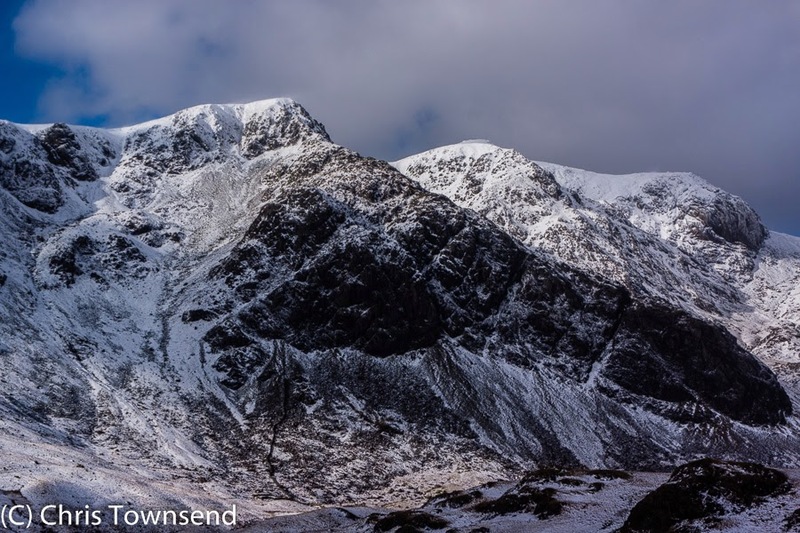 Following The Cairngorms In Winter film we made last winter Terry Abraham has been working on a new project in the Lake District called Life of a Mountain: Scafell Pike. A few days ago I went down to join him to film a winter backpacking sequence. The weather forecast wasn't good but we'd already put the trip off once due to the extremely stormy weather. As it was, we were to be very lucky and have a brief interlude of relatively calm and bright weather between two big storms. This didn't seem likely when I arrived in heavy rain and strong winds. 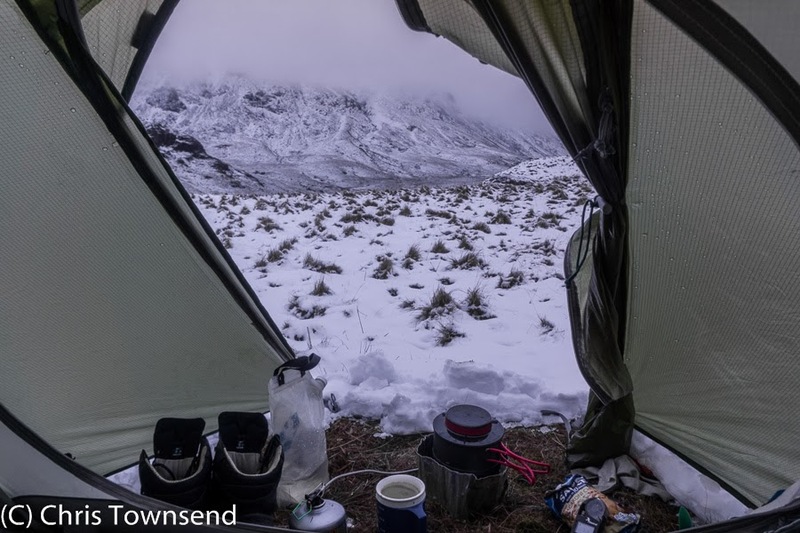 Our first evening was spent in the warmth of The Strands Inn in Nether Wasdale and then the Wasdale Head Inn and the first night was spent in the comforts of camping pods on the National Trust Wasdale camp site. Given the ferocious weather I was happy to have solid walls around me. The morning brought low cloud and a gusty wind but the rain and hail that hammered down during the night had faded away. Mountain guide David Powell-Thompson, who will also feature in the film, drove us round to Eskdale from where we walked up beside the River Esk before cutting up the hillside to camp beside rocky knolls above the flat expanse of the Great Moss with, theoretically, a grand view of the Scafell summits. In fact all we could see were dark clouds low down on the hills. 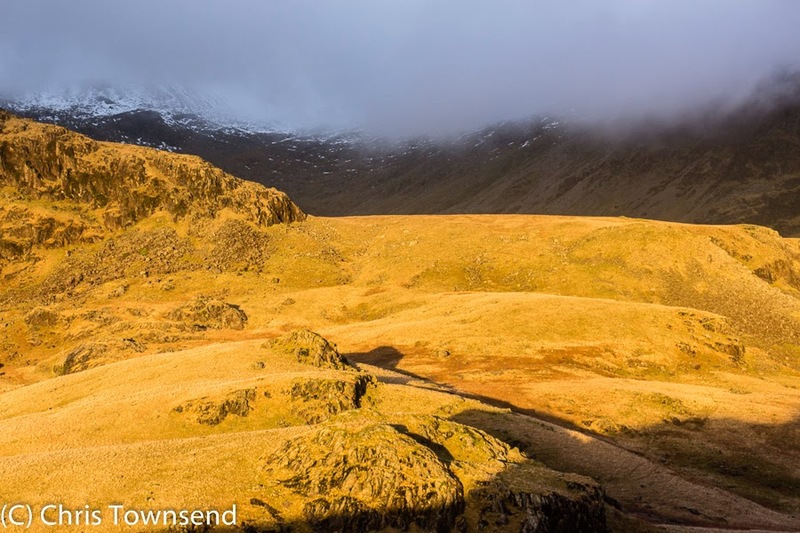 Just before dusk the sun did slice under the clouds to light up some of the lower slopes with a beautiful golden light, a few magic moments before a stormy night. 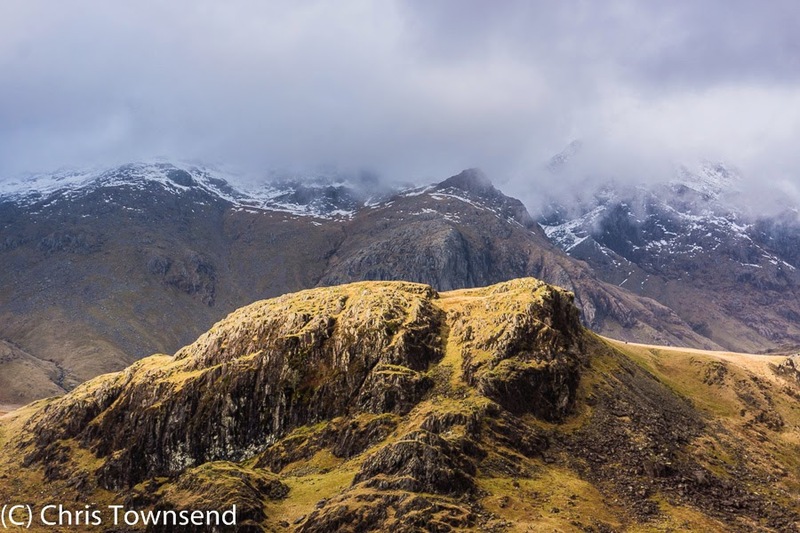 The clouds stayed low so the next day we decided that navigating on compass bearings on the Scafells and seeing nothing didn't really appeal. 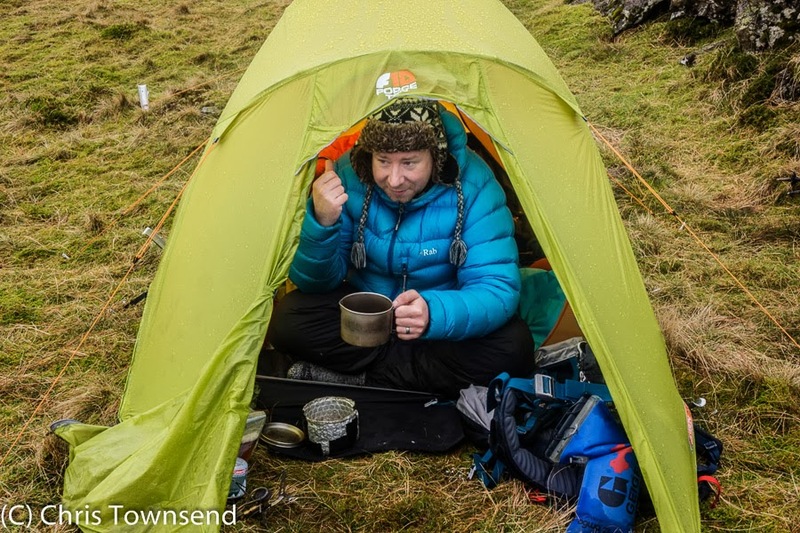 Instead we stayed closer to camp, wandering round the knolls and slopes below the clouds, taking photographs, filming, looking at the rocks and the grasses and the ravens and the sheep and the juniper bushes. It wasn't very cold and only glimpses of snow streaks below the edges of the clouds suggested it was winter. The day stayed dry, thankfully, and not too windy but dusk brought rain and wind. This didn't last though and soon a bright moon with a halo round it shone down hazily through the drifting clouds. Then the mountains suddenly appeared, white and huge, the best view of the trip soar. Terry was soon busy with time-lapse photography. At least the snow-covered mountains would show it was winter. Dawn showed that they didn't need to. Puzzled by a slithering sound and not awake enough to recognise it I unzipped the tent door. A shower of wet snow fell into the porch. 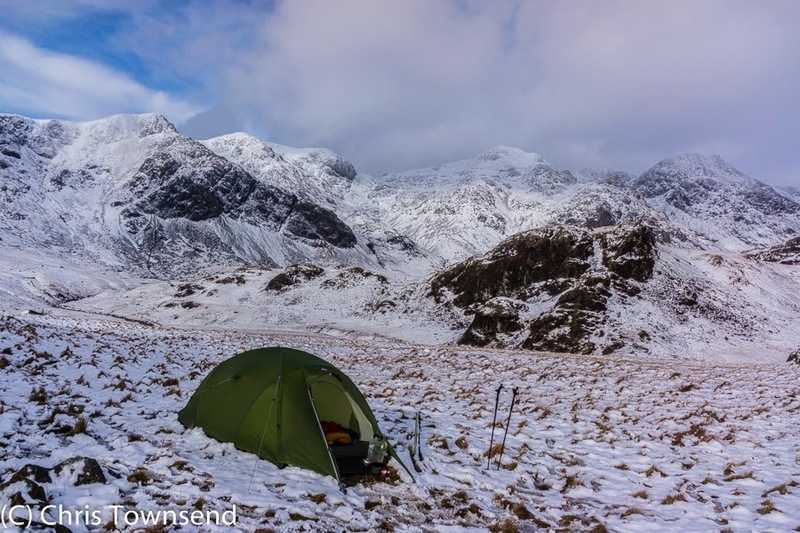 The sound was the snow slipping off the tent when the wind shook it. The hills were still hidden but the world was now wintry. 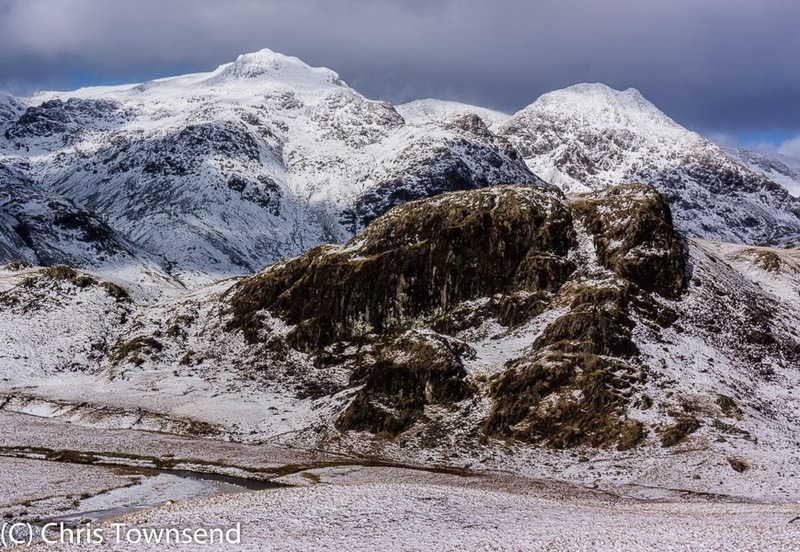 Later in the day the clouds broke up and Scafell and Scafell Pike appeared looking white and huge and glorious, shining in the sun. The light and the views couldn't have been better. This was what we had come for. It was, though, our last day so in the afternoon we packed up and headed back down the valley to meet David and a lift back to the Strands Inn. 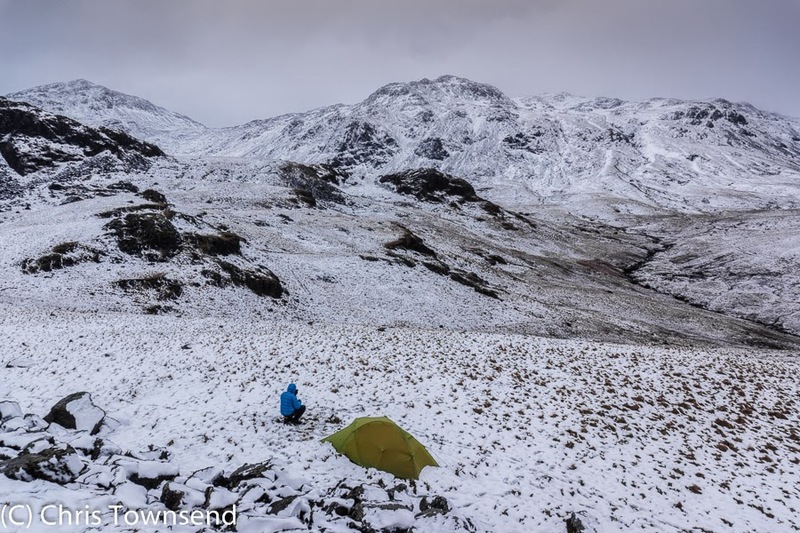 By the time we arrived there the wind was howling and hail was bouncing off the ground. Again I was quite happy to be inside enjoying the excellent food and ale from the inn's own brewery. Terry reckons it's the best pub in the area. I can't say I've been in enough of them to confirm this but it's certainly excellent. The following day the next big storm hit, with high winds and torrential rain. I was racing the storm by train, just staying north of delays and closures, and thinking of those shining white mountains. What tent were you in Chris?. Would it be suitable for someone 6"2 in height?. Force Ten Mtn 2. I think it would be suitable but it's heavy - over 3kg. It's a two-person mountain tent. Yes, it looks big, many thanks!.